Did you know July is National Blueberry Month? I love blueberries so I think we need to celebrate. Get out your party hats and confetti, today is all about blueberries! 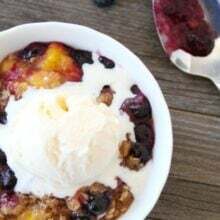 I am sharing a recipe for Overnight Blueberry Almond Oats and 25 amazing blueberry recipes from our blog and around the web. Happy National Blueberry Month! First, let’s talk about the Overnight Blueberry Almond Oats. I love making overnight oats because they are easy to throw together before bedtime and when you wake up, breakfast is ready to go! I like to make my overnight oats in a jar so there is only one dish to wash in the morning. I mix oats, almond milk, Chobani plain Greek yogurt, cinnamon, and blueberries together. I put the jar in the fridge and go to bed! In the morning, I take the jar out of the fridge and top the oats off with almonds, extra blueberries, and cinnamon. I dig right in, there is no need to cook the oats. You may think cold oats sound odd, but I promise they are tasty, especially during the hot summer months. The oats are creamy and bursting with blueberry flavor. And I love the crunch the almonds add. I love making Overnight Blueberry Almond Oats for breakfast. It is an easy and healthy way to start the day! Make this easy oatmeal the night before and wake up to a delicious and healthy breakfast! 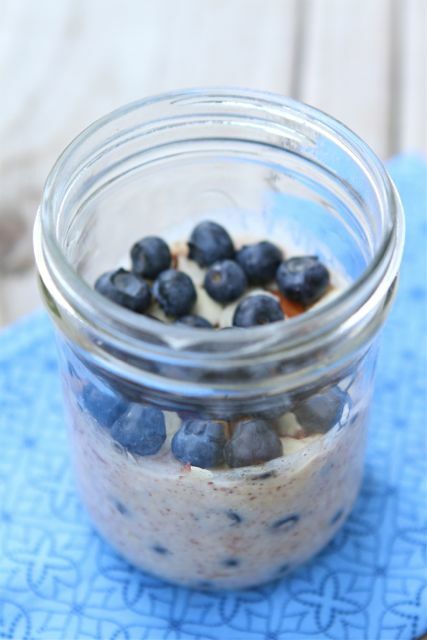 Stir oats, milk, yogurt, blueberries, and cinnamon together in a jar or bowl. Cover and place in refrigerator overnight. In the morning, remove from refrigerator and top with almonds, extra blueberries, and cinnamon. Enjoy! Note-if you want to sweeten up your oats, feel free to add a bit of brown sugar or honey! If you are looking for other ways to enjoy blueberries, here are 25 blueberry recipes that are sure to put a big fat blueberry smile on your face! 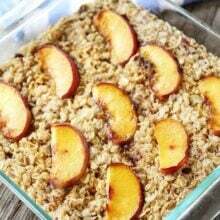 I’m an ‘oats in the morning’ girl, and look forward to trying this non-cook version out! Brilliant! This looks SO yummy and seriously perfect when you know you’ll be having a busy morning. I’m on my way out to the store now so I’m sad that Café Zupas mobile site isn’t working correctly and I can only pull up their menu. Sorry their mobile site isn’t pulling it up. I hope you can look on the regular site…and I will ask them about their mobile site. Thanks for your patience. Yum! Loves yummy! I love overnight oats!! This looks great! I am getting a little tired of my english muffin in the morning. This is a much better substitute!!! I love overnight oats! Steel-cut overnight oats are great, too. Love your round-up of recipes, thank you for including my tea cake! This seriously looks so delicious!!!!! Breakfast I would love to have. I have been making cold oats for a while now and find I can make it before going to work and it’s perfectly soft in about 2 hours. I keep reading about overnight oats, but haven’t tried it yet. Your version looks perfect for our July that’s bursting with blueberries! Thank you for including my jam in your list. Have a great weekend, Maria! Here in Oregon we are luck to be able to grow and pick them, we eat them constantly! This is so great because it’s simple, looks yummy too! I had no idea July was National Blueberry Month! These oats look amazing. It looks like a dessert but it so isn’t, yay! Mmm, I’ve been wanting to try overnight oats for a while…might just have to try this recipe out! Thanks! Second, this recipe sounds/looks delish and simple to make! Thank you! I love this idea. I’ve never made overnight oats before, and these look great. I could have this every morning for breakfast! So comforting! great idea! I looove blueberries so much, this is great! I’m in desperate need of new breakfast ideas… this is so happening. 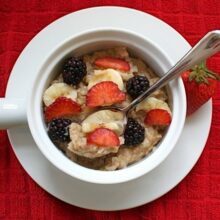 With my love for oatmeal, I’m amazed I still haven’t made overnight oats! I love that you put yogurt in your recipe for a nice creamy tang. 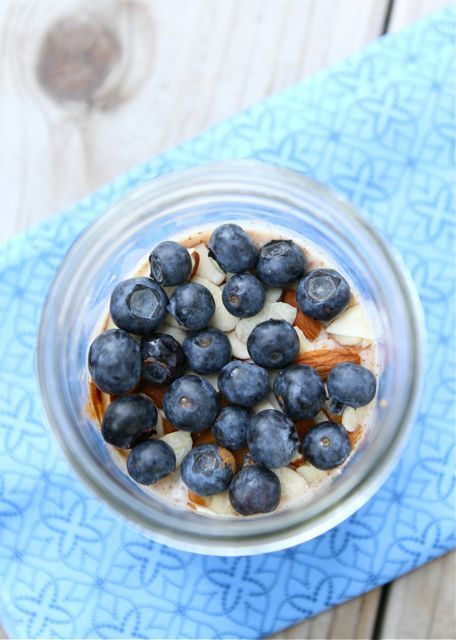 Nutritious breakfast idea and gorgeous in a mason jar! Have a fun weekend! I didn’t know it was National Blueberry month- how fun! Overnight oats are definitely a go to in our house. With a little one (as you know), they make life so much easier!! Perfect breakfast! And the links are great too! I would love this for breakfast! Can you give us the proportions you use? I’ll do anything to avoid waking up any earlier than needed in the morning! Yum! I have a friend ( no really it’s not me) who doesn’t really cook. She makes a giant batch of oatmeal for the week for her family( need I say more?). She really is a sweet thing and I love her. I’m emailing her this recipe. Her family thanks you. Couldn’t email the recipe, so I posted on FB instead, sure my other friends will also enjoy the recipe. it’s blueberry month?! that’s awesome!! thanks for telling me this because I totally have blueberry pancakes in my lineup! these overnight oats look like the ultimate and PERFECT breakfast that i’d love to have! I just discovered overnight oats this summer and they’ve quickly become my favourite – I’ve been eating hot oats forever, so this is a fantastic change. I’ve found that if I add frozen fruit to the mixture, they’re perfectly thawed by morning and their jucies make to oats even sweeter. Wow, this is indeed very useful! I must make these! i love overnight oats! I havent had it in ages though! I will make this recipe tomorrow morning…. I am sick of my same old same old breakfast! haha! my family is from NJ and we have a friend who gets blueberries by the cases for us. we have so much we dont even know what to do with it! we have made pies and bread and just ate them whole and on yogurts, etc. here is yet another way to eat blueberries 🙂 thanks! Wow, what a coincidence! I am sitting here enjoying my own overnight oats with fresh picked blueberries and saw your post. They are a delicious way to start the day and great for a cold breakfast during the summer. I often have blueberry pie for my July birthday but look forward to checking out the other recipes. Thanks! I love blueberries, this sounds fabulous! I am SOOO glad I have blueberries in the fridge right now! Perfect timing for this post! Loving the blue tint to these photos, Maria and the blueberries look so plump n’ sweet! Hope you are having a great July. Hugs to the lil’ pea from me. Great idea. And those oats look hella creamy. Thanks for all the links too!! Can never get enough blueberry recipes. Look at all these fabulous blueberry recipes! Adding a few blueberries to your day is such a great way to boost your daily fiber intake and now we all have oodles of recipes to do just that! i’ve always wanted to try overnite oats. thanks for the inspiration. and WOW look at all those blueberry recipes! YUM. 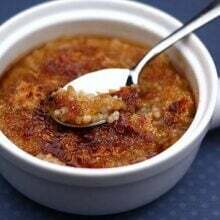 This would make a perfect camping recipe and you are right Maria – perfect for those mornings when the thought of heating anything up is just too much!! I have been eating a very unhealthy amount of blueberries and there is no shame. 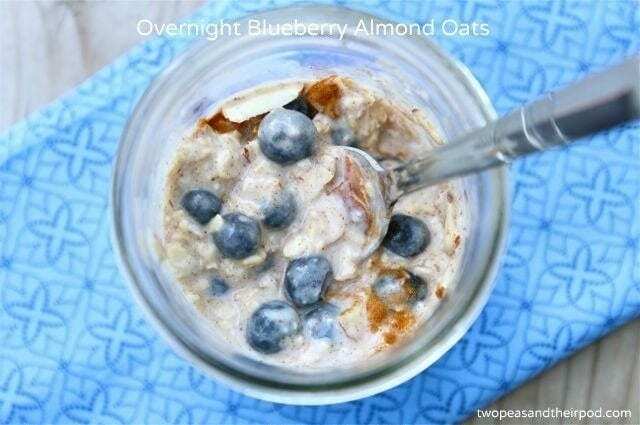 Love these overnight oats – looks delicious! I can’t wait to try overnight oats! I’ve always loved oatmeal for breakfast too but it’s just too hot in the summer! This is so good! I have made it twice and my husband loves it too! Thanks for sharing! Would anyone be willing to share the recipe for this dish? I can’t find it anywhere on the Cafe Zupa web site. 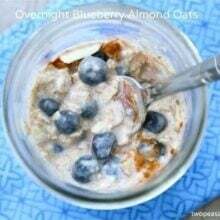 Here is the link: http://www.cafezupas.com/2012/07/overnight-blueberry-almond-oats/ It is working for me. I hope it works for you! Delicious. I added honey the next morning. It was great. Incredibly filling.